Find out which stocks played the biggest role in helping the Dow double. Last week, the Dow Jones Industrials (DJINDICES:^DJI) came within a fraction of a point of reaching the 20,000 level. Given that the Dow traded below 10,000 as recently as August 2010, the strong return over a period of just over six years required contributions from every component of the average, and indeed, all 30 stocks that are currently in the Dow have posted positive total returns over that timeframe. However, some Dow stocks have had better returns than others, and UnitedHealth Group (NYSE:UNH), Home Depot (NYSE:HD), and Visa (NYSE:V) have helped lead the way higher for the average. Let's look more closely at these stocks and whether they can help push the Dow even higher in 2017 and beyond. UnitedHealth Group topped the 30 current Dow stocks since August 2010, with total returns of more than 450%. Yet the company wasn't even a member of the Dow throughout that period, joining the average in late 2012 to become the only health insurance company among the Dow 30. The move was motivated by the breakup of Kraft, which separated its domestic food business from its international snack division and created two distinct publicly traded companies. The move has been a smart one for the Dow, as UnitedHealth has dramatically outperformed both Kraft Heinz and Mondelez since the switch. UnitedHealth has taken maximum advantage of changing conditions in the health insurance industry. Its Optum business includes both pharmacy benefit management and healthcare services, which have become vitally important for businesses seeking to control their overall health benefit costs. At the same time, UnitedHealth has navigated the insurance aspects of the business well, avoiding the full brunt of Obamacare-related losses while taking advantage of greater enrollment in expanded Medicaid programs. More healthcare reform is likely coming, and UnitedHealth finds itself better-positioned than many of its peers to adapt and profit from those changes when they arrive. That should help the company continue to lead the Dow higher if things go as expected. 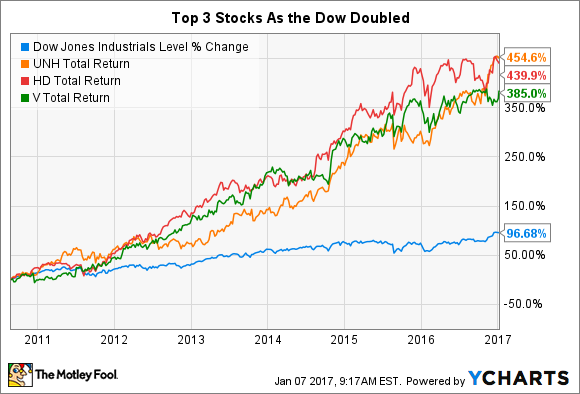 Among these three stocks, the only one that has been a Dow component for the entire period since the Dow last climbed above 10,000 is Home Depot. The home-improvement retailer has done a good job of capitalizing on the rebound in the housing market following the real-estate bust and financial crisis in the mid- to late 2000s, with a total return of 440%, and Home Depot has also managed to outpace its competition in serving as large an audience as possible. Going beyond its initial do-it-yourselfer roots, Home Depot has dramatically increased the amount of attention it pays to professional contractors. That has helped it retain maximum exposure to the home improvement field even as the economy grew, because many homeowners who were better off financially than they had been in past years were happy to hire professionals to do needed work rather than trying to do it themselves. Some investors have gotten nervous lately that Home Depot could find itself less able to sustain strong stock returns going forward. A rise in interest rates over the past two months has spooked some about the health of the housing market going forward. Moreover, Home Depot has already seen signs of slowing growth in its own operations, and the company hasn't chosen to seek expansion through building a substantial number of new locations. One thing investors need to remember, though, is that Home Depot stock actually survived the mid-2000s housing bust fairly well, finding ways to cater to underwater homeowners who needed to do work to make their properties marketable. If the retailer can keep finding ways to meet consumer needs, then Home Depot could keep climbing despite its strong performance. Finally, Visa is the newest member of the Dow among these three stocks, joining the average in September 2013. In the three years from 2010 to 2013 during which Visa wasn't a Dow component, the stock tripled, playing a big role in its total 385% rise since 2010. Yet even though the Dow missed out on what could have been an even bigger gain if it had included the electronic payments giant sooner, Visa's high share price during its initial period in the average made a disproportionately large upward contribution to the price-weighted Dow. More recently, Visa has made many moves to bolster growth. Entry into the lucrative Chinese market has huge potential for the company, and the acquisition of Visa Europe gave Visa back truly worldwide scope to compete better abroad against its main rivals in the industry. That said, even though economic conditions throughout much of the world haven't been as strong as many would like, Visa's relatively sharp focus on the U.S. market has served it well. Going forward, there are many opportunities for Visa to tap into greater adoption of electronic payments systems, and that should help Visa continue to rise. The Dow didn't quite make it to 20,000, but the rounding error doesn't change the fact that the average has done quite well in the past several years. With the continued help of Visa, Home Depot, and UnitedHealth, further gains for the Dow could be in the cards in 2017 and beyond.